Now is the season for lavender in the Pacific Northwest and my three shrubs are completely resplendent with beautiful blossoms. 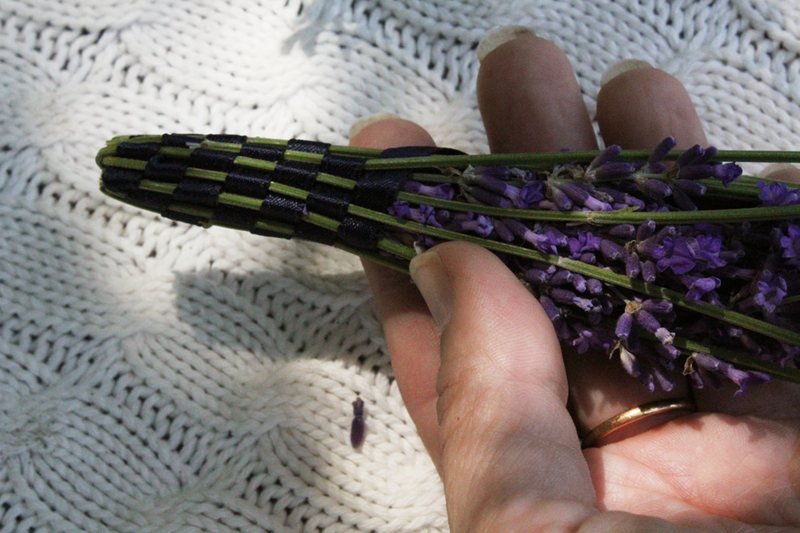 Now is the time to make some beautiful lavender wands or cages to give as gifts, keep with your lingerie or decorate your home and keep the fresh smell of summer all year long. It’s really easy, I’ll show you how. 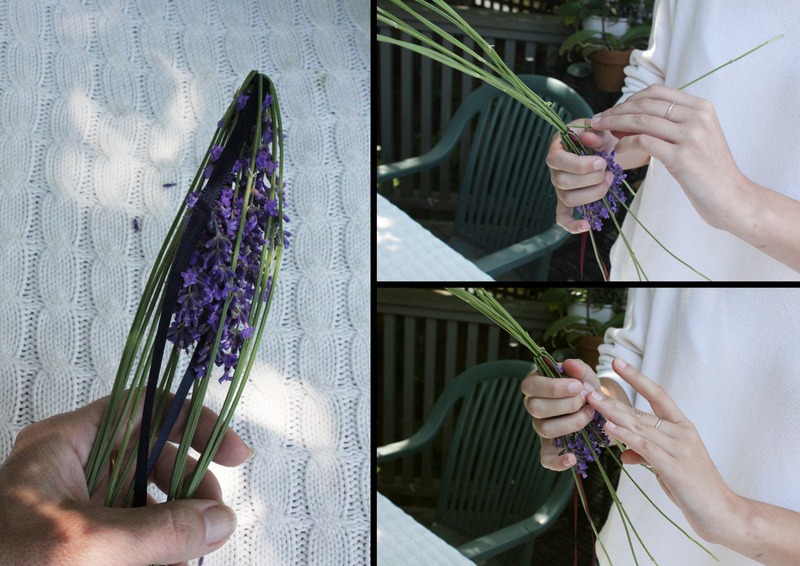 Gather some longer lavender stems in full blossom. It’s pretty important to chose an odd number of stems for this process. I like 13, Chloe likes 15 stems. Lay them on your work surface and make sure they are all pretty well the same length. That is, don’t have some 12 inches long to some 5 inches long. Strip off the bottom leaves and some of the mid flowers. Any hitchhikers must be gently lifted off and coaxed over the garden fence. If you’d like a fat wand then place the blossoms all together, if you’d like a long wand the stagger the blossoms somewhat. Choose your spool of ribbon, one of those narrow spools from the craft store is ideal. Don’t cut the ribbon from the spool. Tie your bunch together just below the blossoms taking care to leave the end long enough that it reaches maybe 6 inches or more past the blossoms for the tie at the end. 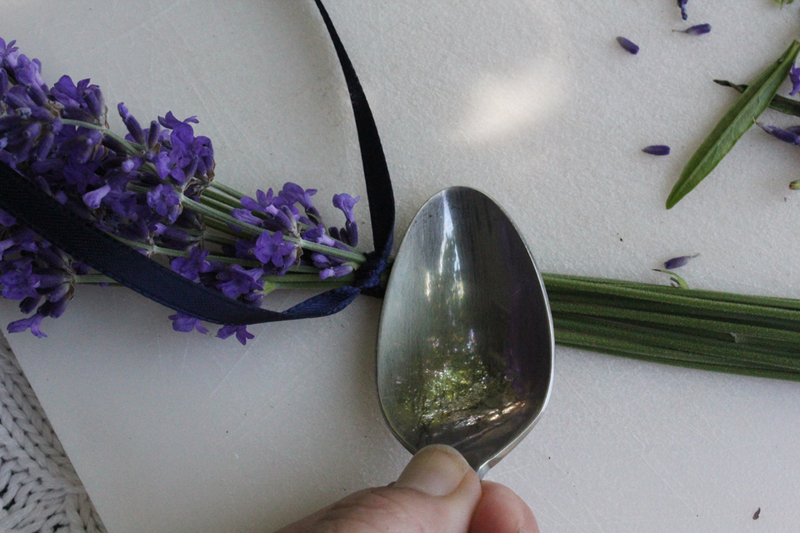 Use the back of a spoon to gently bruise the stems just below the ribbon. This will help to bend the stems back without breaking any. 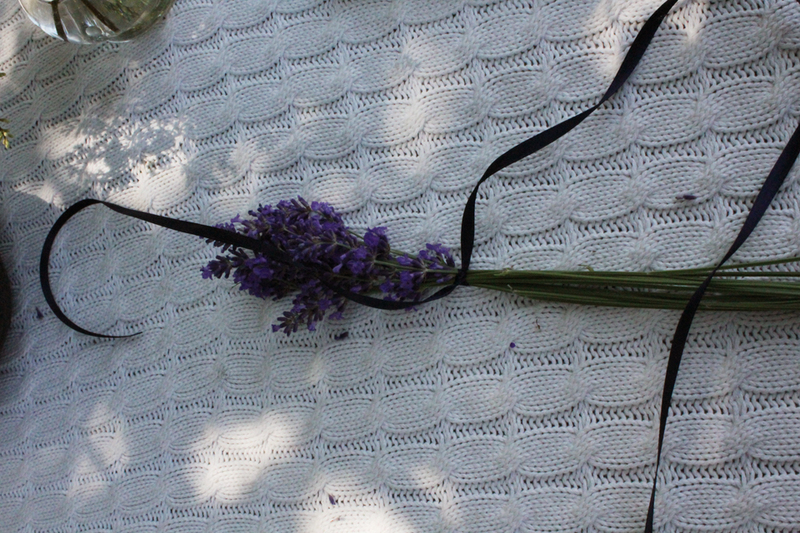 The lavender is fresh and pliable so the stem probably wont snap, but if one does snap, don’t worry, the ribbon will hold it in place. Now gently bend the stems back on themselves. Some people will tie the bundle off at this point. That makes a lavender cage and cages are really charming. But let’s go on to a wand. Hang the cut end of the ribbon thru the flower centre and take the spool end and start weaving the ribbon thru the stems. 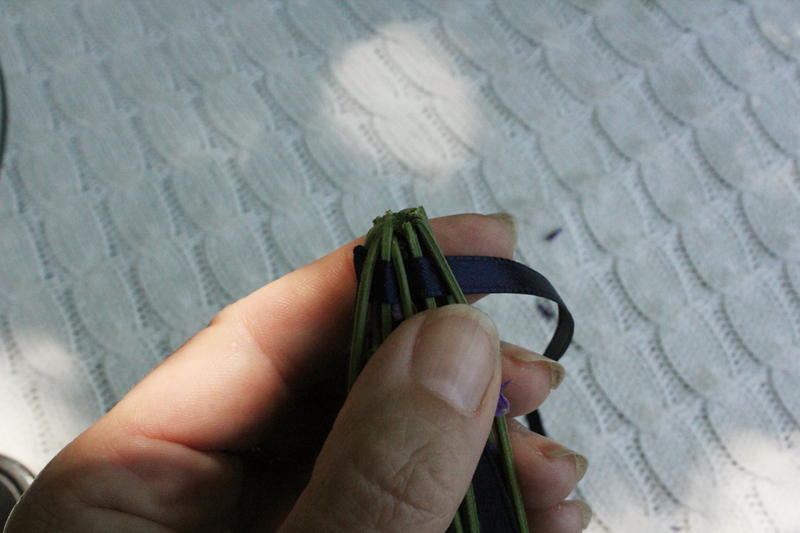 Go over and under and over and under just like your first ever weaving you did as a child. Now is when the importance of the odd number of stems comes in. When you finish the first layer and come back to the first stem you began at, you will find that the natural progression will continue with the rhythmic over and under instead of having to deal with two overs or unders beside each other. 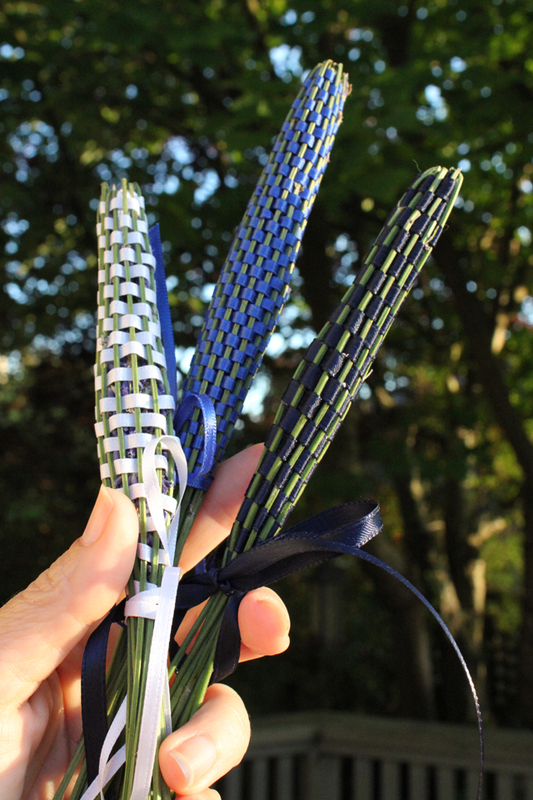 Pretty soon you will begin to see the beautiful ribbon weaving take shape and all that lovely lavender goodness protected within. …while C makes them looser. 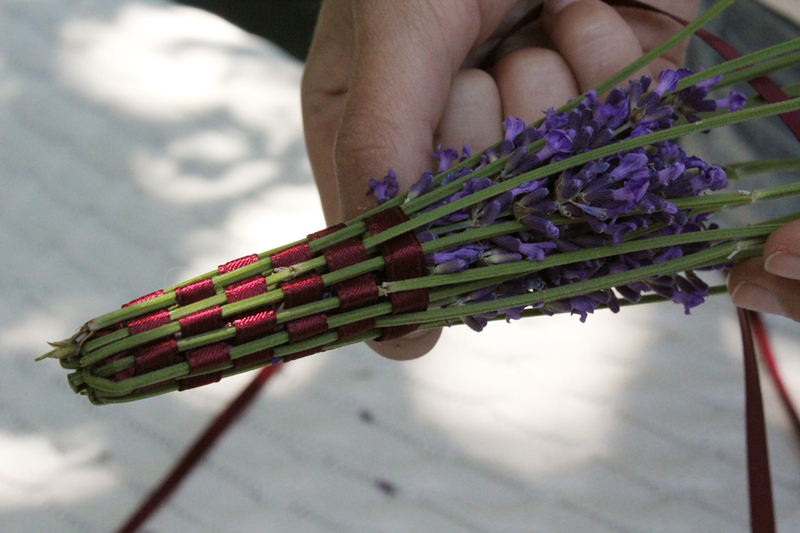 When you weave past the blossoms, pull the ribbon tightly and wrap it around the stems. Use the end you’ve let hang from the blossoms as one side of the tie, the spool end as the other side of the tie and tie yourself a pretty bow. Now cut the ribbon from the spool end and admire your lovely wand. Lovely idea. V, you are so creative. These are so pretty – I am thinking I’m going to have to try this one! 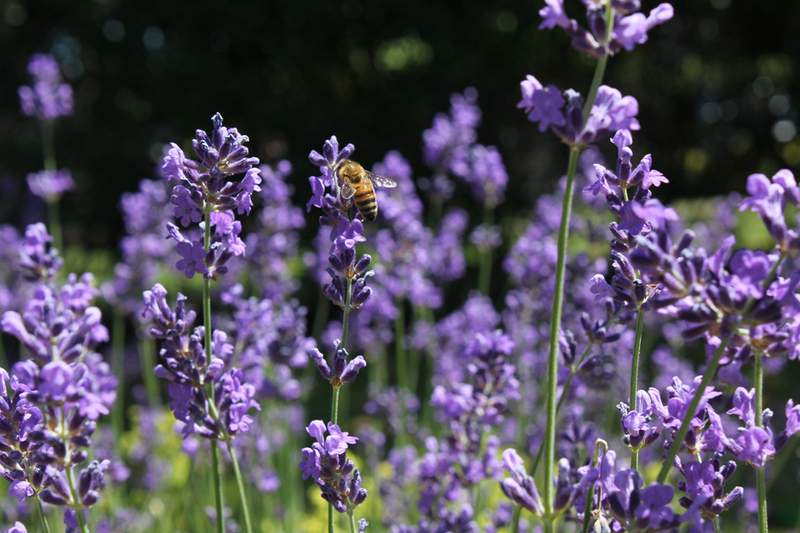 Gorgeous – thanks for sharing this I’m now even more determined to get some garden space to grow lavender. I don’t think my paltry deck tubs will supply much of a harvest this year. 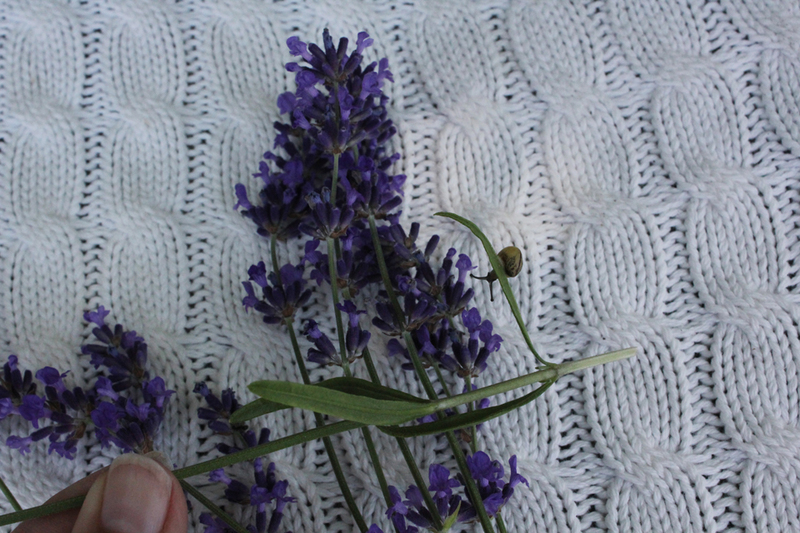 I need a pick your own lavender farm! Check out what I did!! This is such a wonderful post. Besides being beautiful to look at, it is so very inspiring. 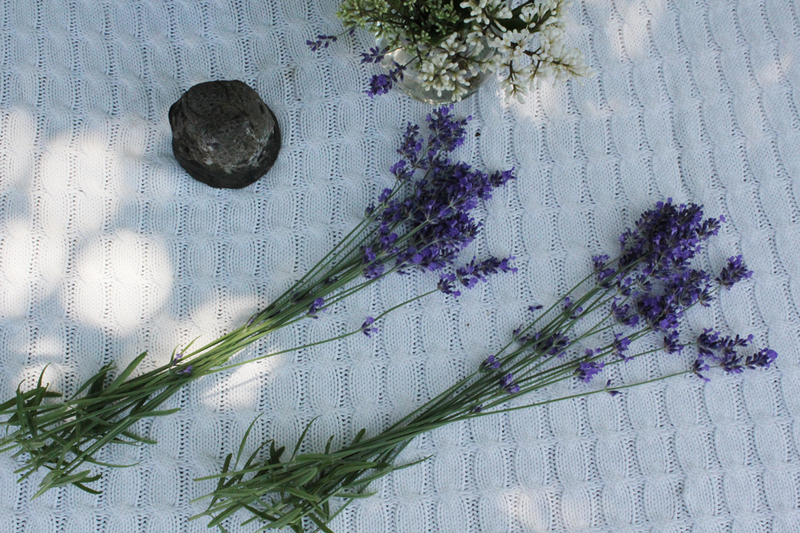 I was just wishing I knew what to do with such gorgeous lavender blooms. Thank you so much for sharing your craft here. 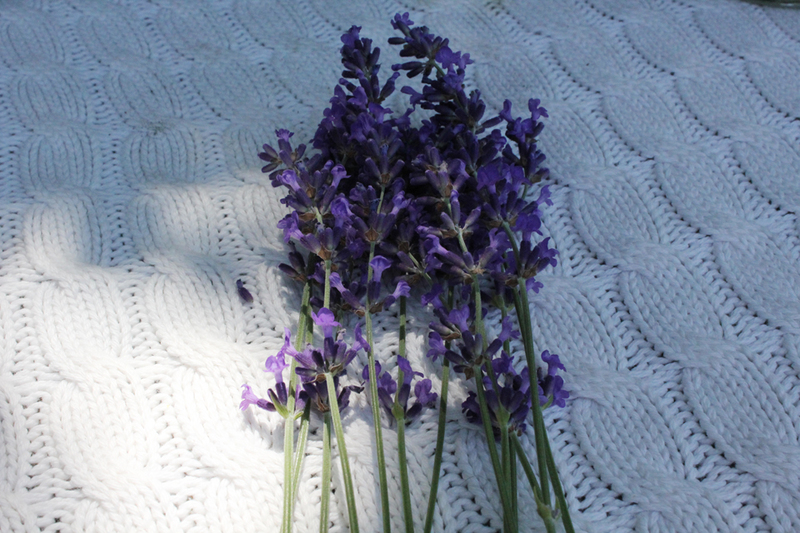 thank you for your tutorial how to make these beautiful lavender wardds. Its the same way how the Frech people from Provence do it. Looks and smells lovely. Thank you so much for sharing this.. I live in Indonesia and I love lavender scent.. I bought two pots of lavender a couple of years ago, and they have become several pots now.. So, I’m searching for ways to use them.. 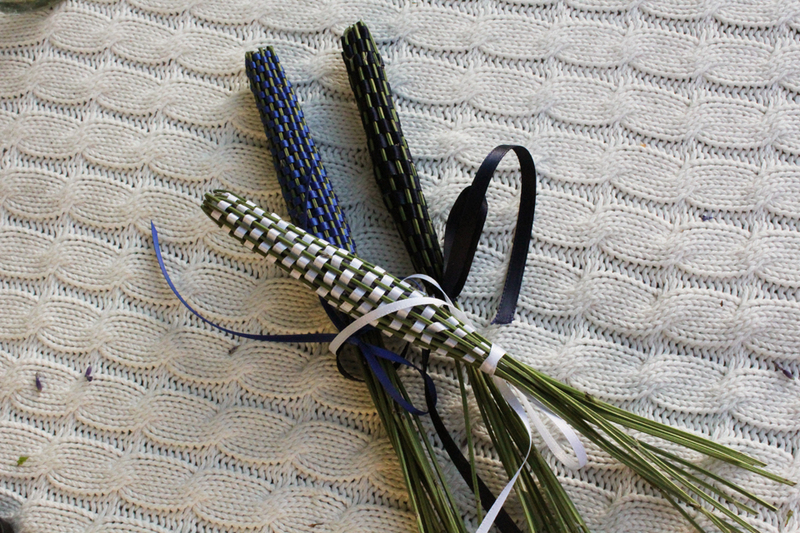 These lavender wands would make it easier for me to place them in the car.. I will surely try to make them..